It is no secret that deleting messages, especially delete all mail on iPhone is very difficult. 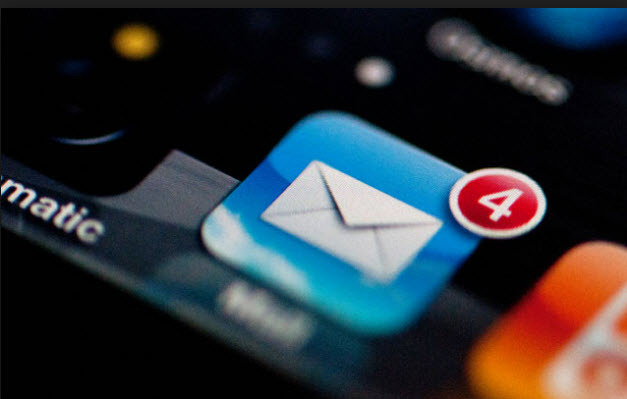 Many people have struggled to delete some unnecessary emails, because it is hard to know just where the delete or trash button is in the iPhone. The iPhone only offers three options when you open your mail: move, archive and mark. You will thus opt to archive the email, but this does not delete it from your phone. This problem is very common with iPhone 7 and all the other previous versions of the iPhone. However, with spending just a few minutes with the phone’s settings, you may be able to successfully delete all mail from iPhone. Go to the mail app and open it. Tap the inbox that you wish to have its contents deleted from your mail list. Tap on the edit button, that is now conveniently located at the upper-right corner of the screen. Three options will now appear on the lower part of the screen: Mark All, Move, and Trash All. Click on the Trash All button. A prompt message will appear, asking you to confirm whether you wish to delete all the mail from that particular address. Proceed to trash all the mail from that particular address. 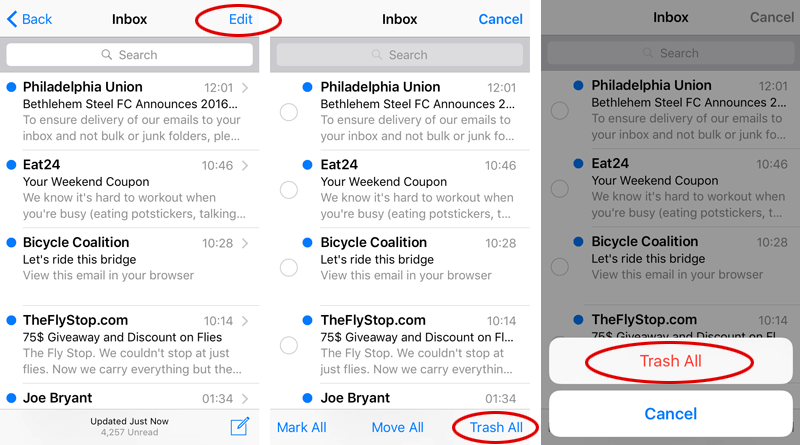 You can subsequently delete all the mail on iPhone that you have received by opening your mail app, taping on the Trash All button, and then confirming that you wish to delete all the mail in your mail app. This should however be done cautiously, if you do not wish to go back to the trash, for some email that you may need in future. You should thus be sure of which mails to trash and which not to. 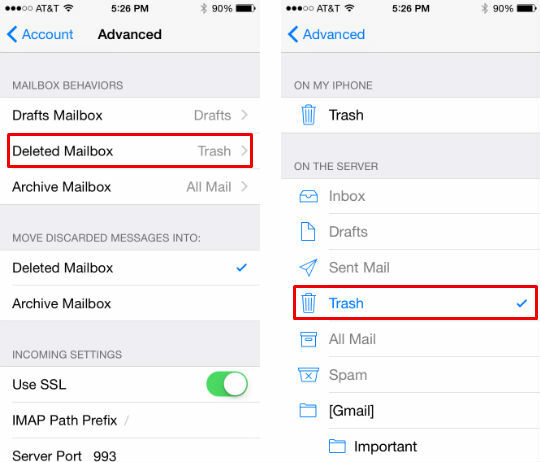 If you want to empty your iPhone mail trash, for getting back more iPhone storage or just because not want these mails any more, here is a step by step guide to empty iPhone mail trash , you should have a look! Go to your mail app and open your inbox folder. Tap on edit that is on the upper-right corner of the screen. Tap on Mark All, and then tap on Mark All as Read. After this, the Edit window will close. Tap on the Edit button once more, and then select the topmost message from your emails. This is now the most important step. Press and then hold the Move button. While still doing this, uncheck the first message that you had checked before, and then finally release your thumb from the Move button. This should then take a few minutes for your screen to pop up the Move screen from where a few options of where you wish to move the mails will be provided. Select the Trash button, and all your mail will be moved to the Trash Bin folder. If say you had a lot of mail to be moved to Trash, it may take a while before the graphics show that the items have been moved to trash, so be patient and wait for the signal that shows that all is clear. This is by far a much easier way to mass delete a bulk of mail from your inbox. You can also change the Mail, Contacts and Calendar settings from the accounts settings tab to make it possible for you to mass delete junk mail on iPhone, though this is for just one particular mail account. Precautions should be taken when performing this action, as all the mail will be moved to trash. Should you have mail that is important and do not wish to move it to Trash, it is highly advisable that you first keep it in a safe folder where it won’t be deleted. You may wish to delete all mails from your iPhone due to lack of much needed space. The iPhone is indeed a great phone, and much can be done with it. 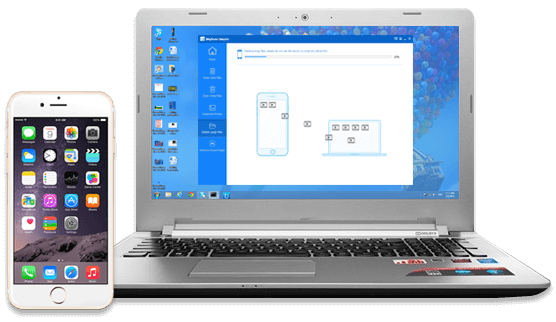 If, however you wish to have a much quicker and easier way of managing the mail that you do not wish to have in your mailbox, you can purchase software that does this, such as the iMyFone Umate Pro or iMyFone Umate Pro for Mac that has features that make it possible to save huge iPhone storage in no time. And it provide a free tiral version, you can have a try! Clean all junk files with a click. Clear temporary files to release big space. Photo manager - Compressing photos losslessly & mass deleting photos. Detect and mass delete large files to free space. App manager - seletively delete some or all the third party Apps. Does iOS 12 Support iPhone 5s? Here Is the Answer!